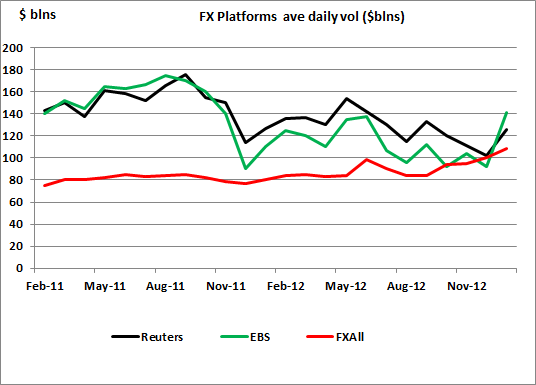 Reuters, FXall and EBS have now all released their FX vols for Jan 2013, with a strong bounce in volumes. The largest increase coming from EBS with a 54% increase. FXall looks like a record for daily volume. 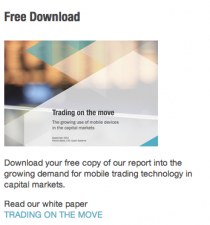 The average increase of all three platforms being +28pct from Dec 2012, compared to the LeapRate retail FX volume index which shows an 18pct increase for the same period. By contrast the BofE semi-annual FX vol survey released last in Jan showed a 6% decline in FX vols from Apr to Oct 12.